4. To Facilitate measures to improve learning outcomes and attract more learners. 5. To facilitate measurers to improve learning outcomes and attract more learners. 6. To Finance Sports and other Co-curricular activities. 7. To Finance capital development and maintenance works of Primary and Secondary Schools. · Ensuring delivery of relevant quality education and training. · Enhancing efficiency and effectiveness of education and Sports service delivery at all levels. Schedule 2 part 2 of the Local Government Act, the Education and Sports function and services for which the District Councils are responsible, subject to article 176(2) of the constitution and sections 96 and 97 of the local Government Act, include services which cover Pre- Primary (Nursery), Primary Secondary teacher Education Science and Technology Innovation Special Needs and Technical and Vocational Education. Part 4 mandates the District to devolve the Provision of Nursery and Primary Education to Lower Local Government Councils i.e. Municipal Councils. 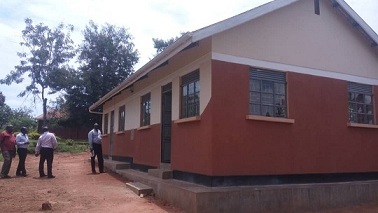 Construction of a 2 classroom block with lightening arrestors and hand washing facilities at Bugembe Primary School, School Zone, Budumbuli West, Bugembe Town Council, Butembe County. Construction of a 2 classroom block with lightening arrestors and hand washing facility at St. Matia Mulumba Primary School, Buwolomera Village, Kagoma Parish, Buwenge Sub county, Kagoma County. Construction of a 4 in one staff house at Ndiwansi Primary School, Ndiwansi village, Lubani Parish Butagaya Sub county, Kagoma County. Installation of 10,000 liters rain water harvesting tanks at Kyomya, Lukolo, Musima and Buwagi Primary Schools. Soft Power in partnership with Raincatcher org. Construction of a 2 classroom block with an office and store and lightening arrestors at Namasiga Primary School, Namasiga village, Namazaala Parish, Busede Sub County, Butembe County. Construction of a 4 in one staff house at St, John Kizinga village, Kibibi Parish, Budondo sub county, Kagoma County. Construction of a 4 in one staff house at St. Matia Mulumba Primary School, Buwolomera village, Magamaga Parish, Buwenge Sub County, Kagoma County. Construction of a Multipurpose Science laboratory at St. Gonzaga Senior Secondary School, Magamaga village, Kagoma parish, Buwenge Subcounty Kagoma County. 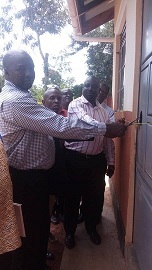 Renovation of four classroom block at Namalere Primary School, Namalere Centre, Kagoma Parish, Buwenge sub county, Kagoma county. Soft power Education in partnership with Africa expedition. Soft power Education in partnership with other organizations. Construction of a 4 in one Teachers House at Butangala Primary School, Butangala village Magamaga Parish, Buwenge sub county Kagoma county. Construction of five stance VIP brick lined Pit latrine with hand washing facility at Kyomya Primary School, Kyomya village, Buwagi Parish, Budondo sub county Kagoma county, Lumuli primary School, Bunalya village, Nakakulwe Parish, Butagaya sub county and Bubugo Primary School, Bubugo village, Nawampanda Parish, Butagaya sub county, Kagoma county. Renovation, Rehabilitation and Installation of Solar power and construction of rain water harvest tanks in selected Primary Schools across the district. Soft powers partnership with other development partners. Construction of 2 five stance VIP brick lined pit latrines for the 87 Public Primary Schools. Purchase of SNE materials including Audio/Visual, Play materials and gadgets to equip the Special Needs Education units. Purchase of Games and Sports, Music Dance and Drama equipment for Schools and facilitating the District, Regional and National levels. Construction of Head teaches and Deputy Head teacher house for 8 secondary schools. Reroofing of Wanyange Girls, MM College Wairaka, Busoga College Mwiri, PMM Girls, Jinja College, Jinja S.S.S and Mwiri Primary School with Iron Sheets to replace asbestos. The main purpose of Education department in the district is to coordinate, give technical and professional guidance and advice in the management, accountability and implementation of policies, programmes and decisions.